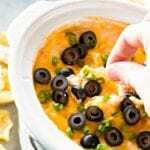 This Easy Slow Cooker Chicken Enchilada Dip is so Cheesy and Amazing! The Perfect Easy Dip Appetizer for Your Parties! Sprinkle chicken breast with taco seasoning and bake in preheated oven for about 15 minutes or until cooked through. Shred chicken. Put into 4 qt. Slow cooker and cook on high for 1-2 hours or until heated through. Top with additional grated cheese, cilantro and black olives. Serve with tortilla chips.